Chart of the Month - Drivers of US GDP growth: Can the US grow faster? DRIVERS OF US GDP GROWTH: CAN THE US GROW FASTER? Before the US election, the consensus view was that potential growth for the US economy was about 1.5% – 2.0%. After Trump won the elections, many market players are discounting higher growth rates due to the coming deregulation and fiscal stimuli. Whether this potential growth is 1.5% or 3.0% has very important implications in the capital markets, so it is worthy to review the main drivers of growth and what we can expect. Natality rate has been decreasing over time, so the previous disappointing trend of lower birth rate is likely to continue. Immigration rate, if properly controlled, has been an important source of growth in countries like the US, Australia, UK or Switzerland to name a few successful ones. If UK or USA reduce the immigration rate, chances are that this source of growth decreases during the next decade. It would be especially bad for the US to restrict immigration for the high skillful people who would go to the USA to work for the Information Technology industry. 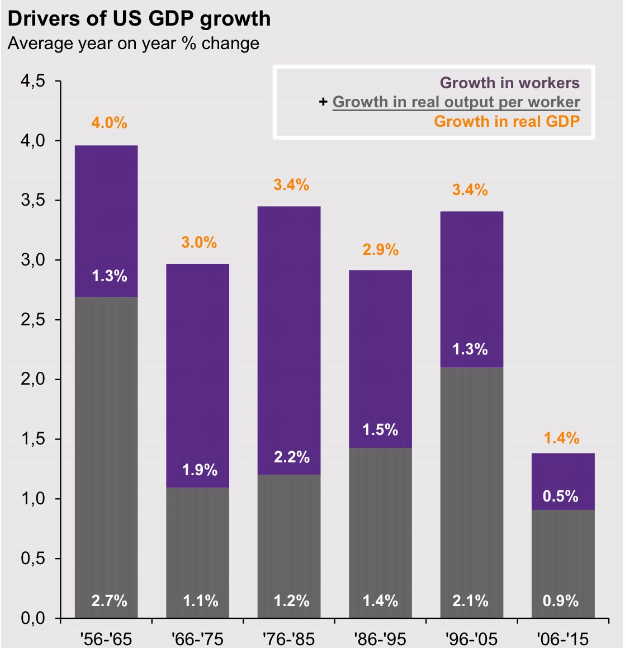 Growth in real output per worker. First of all, it sounds counterintuitive that productivity has increased at a lower rate during the last “information age” decade. We are not going to talk about this as there are a lot of good academic papers that covers this issue without a definitive conclusion, but facts are facts, and productivity growth is running at the lowest Post-WW2 level. Capital investments: Good capital investments in infrastructure, IT, etc. increase real output per worker. The infrastructure investments that will be done by the Trump administration will certainly contribute to higher productivity in the USA. Regulations: Red tape and excessive bureaucracy are deterrents of GDP growth. The Trump administration will improve this. Human capital: This is one of the most neglected part of the sources of GDP growth even though is evident to most people (we all spent a lot of money on our children’s education). In the Trump’s agenda there is no indication that the US will be spending more money on human capital. A very interesting idea is to promote the vocational school system in place in countries like Germany, Austria or Switzerland where productivity is good and unemployment is low, even in the sectors exposed to globalization. Free International Trade: It is difficult to introduce this element in the chart, but according to most academic studies since Ricardo, Free International Trade is mutually beneficial to everybody. That is why WTO has been so successful and that is why the European Union started with 6 countries and went to 28 (likely to go to 27 after Brexit). GDP growth enhancers: Infrastructure investments and lower regulations. GDP growth deterrents: Immigration policy and less international trade. GDP growth neutral: Similar natality rate and no changes in the educational system. Depending on the magnitude of those policies, we will see the impact on the coming GDP growth, and honestly we do not know at this stage, but is good to have a handy framework with the relevant variables. Previous Chart of the Month - Looking for an Investment Opportunity? Think Luxury!